WARNING: This is going to be a "LONG BORING POST" if you are not interested in learning more about what is "Conflict of Interest" or "Separation of Powers". In this post, I am not interested on the Oxley House itself but what came out from the whole saga; especially on the issue "Abuse of Power" and such. Mr. Lee Hsien Yang and Dr Lee Wei Ling had made serious accusations of "Abuse of Power", among other things. PM Lee Hsien Loong claims that he has "answered" all these allegations in parliament and concluded that these are "baseless". From recent events in the appointment of Deputy Attorney General, Attorney General to this Oxley Temple Saga, it is clear that Singaporeans didn't really see any problems with the massive potential conflicts of interests as well as the breach of the simple rule of Separation of Powers. I personally feel that this is the main weakness of Singapore. Singaporeans lack a clear understanding of the importance of Separation of Powers and what constitutes "Conflicts of Interests". It is also apparent that even our opposition MPs have weak understanding or even lack of understanding of Separation of Powers and Conflicts of Interests; else they won't be found or criticized for the lack of proper handling of potential "conflicts of interests" in the management of their Town Councils. They have tried to make a case of Conflicts of Interests in parliament against the appointment of Hri Kumar and Lucian Wong as Deputy AG and AG but it wasn't forceful nor "convincing" at all. And it is not surprising that they did not see the case made out by PM Lee's siblings as convincing and important enough to call for investigations of any sort, but pass these allegations off as "baseless" or "lack substantial evidence" and conclude these as "calculated accusation to undermine the PM". They even gave the PM "benefit of doubts" over these issues! Let me go through the various issues one by one, giving a contrast by putting up examples from Hong Kong. Why Hong Kong? Well, both Singapore and Hong Kong adopted the Common Laws as the basis of our legal systems. It is comparable in many sense. It is a fact that the appointed AG Lucian Wong was PM Lee's personal lawyer as stated by LHY and LWL. It is a fact that the appointed Hri Kumar was a PAP MP. PM Lee tried to brush away the accusation of him appointing his own personal lawyer as AG as non-issue because he opines that Lucian has "provided good service" to him! Now some people pointed out there is "Conflict of Interests" but didn't know exactly how interests could be "conflicted". This is why PAP could get away with such blatant act. There are actually TWO GREAT Problems here, instead of One. Conflict of Interests is only one of the problems. The other is the breach of the Democratic Principle of Separation of Powers. Let me give you an example and you will see clearly why there is a potential conflict of interests here. If you are the Director of a Stats Board or department in the civil service. You made the recommendation of a lawyer as the legal advisor of the department, without declaring that he is your personal lawyer, would that be permissible? Obviously not. Why would that be considered as "Conflict of Interest" in the first place? Well, as long as there is a relationship (close relationship) or business dealings between the Director and the lawyer, there will be a possibility of transfer of tangible or intangible interests which may be suspected to result in the favorable decision to appoint or give the contract to the lawyer. For example, hefty discounts or even "Free Service" provided to the Director for his personal matters and in return, the Director decides to appoint him as legal adviser to the department. These possible events may not have happened but as long as there is such possibility, the relationship must be declared. i.e. If there is nothing to hide, you should declare such relationship. Now, regardless of whether there is any "favors" transacted between the PM and his lawyer, which means, we do not need to prove there is such transactions of goodwill or favors, PM should declare such interests or relationship when he proposed and made decision to appoint him as the office holder of Attorney General. The question now is, did PM Lee make such declaration in the process of appointing Lucien Wong as AG? I believe that after the Hotel Property saga which PM Lee was implicated, PM Lee should now be extremely careful to accept any "discount" or even "free" service from anyone, but still, in the system of good governance, such potential conflict of interests should be dealt with proper declaration in the process of selection and appointment. This is especially so when there is no indication that PM has recused himself from this decision of AG appointment. Thus, what Opposition MPs in parliament should ask is, did PM Lee declare this critical potential conflict of interests in the process of appointment? He did not mention it nor make proper declaration of such relationship when the previous parliamentary sitting had a debate on the appointment of Lucien Wong as the AG! The second aspect of such appointment of Lucien Wong as AG, together with Hri Kumar as DAG, is the breach of the Democratic Principle of Separation of Powers. In People's Power Party's concept of Separation of Powers, there are Five Powers. This is more stringent requirement but even for the normal concept of Separation of Powers which involves mainly Three powers or maybe even the forth state of Freedom of Press, it is important to note that the Executive, Judiciary and Legislative powers should observe a strict separation to effect Independent functioning of these institutions of the Democratic system, without fear nor favour. AG office is an important part of the Judiciary system and it must not only act Independently but also SEEN to be Independent of the Executive and Legislative arm. The appointment of Lucien Wong as the AG has breached the rule of independence of the AGO from the Head of the Executive Arm, i.e. PMO! The appointment of Hri Kumar as DAG, who was ex-PAP MP (or what we call legislative member) is also a breach of the rule of independence of the AGO from BOTH the Executive arm as well as the Legislative arm! (PM is effective the leader of the ruling party PAP which dominates the parliament, the legislative arm). Thus in any way we look at it, these appointments are totally inappropriate and smack of effecting a non-Democratic rule because the basic principle of Separation of Powers has been seriously breached! Thus, the important question we should ask is, do we still want Singapore to be a developed Democracy or just regress into a system of authoritarian or dictatorship whereby Separation of Powers is basically non-existent? In Hong Kong, such situation will never happen, especially for appointments of important positions in the Judiciary system, be it AG or Chief Justice. Even for positions which are less sensitive like Board of Directors of university, if the Chief Executive appoints people who have direct relations with him, the whole society will criticize such moves. It has happened before during CY Leong's term. But as this doesn't breach the Principle of Separation of Powers (Board of University is not part of the 3 powers) and such appointees are WELL KNOWN to be politically connected to the CE and no obvious transactions of service nor interests, no further actions were taken. LHY and LWL had accused PM Lee of obtaining the Deed of Gift via his official capacity as Prime Minister and (passed it to his lawyer) used it against them. PM Lee had explained that as one of the inheritor of LKY's assets, he has the "right to know" or have the Deed of Gift. However, whether the PM has the "right" to the Deed of Gift or not, is PRIVATE matters between him and his siblings. This is purely a PRIVATE matter. To make use of his official capacity of PM to get the deed, which Minister Lawrence Wong has confirmed that LHL received the Deed via his official capacity as PM, and pass it to his PRIVATE lawyer to settle his private matters with his siblings, is already a breach of procedure and official protocol. I believe there are laws governing the proper use of information obtained in official capacity as we have seen in recent cases, police officer was charged for accessing information in their official capacity but pass these information to his friends for their private use. Any information obtained by any civil servants or political appointees in their official capacity, should only be used for official business instead of private matters! That's the basic protocol of any good governance for the civil service! The evidence provided by LHY and LWL had clearly shown that LHL's PRIVATE Lawyer has indicated that LHL has passed the Deed of Gift to the law firm while Minister Lawrence Wong has confirmed LHL received the Deed via his Official capacity of PM. This is a clear breach of protocol. The proper way for LHL to get the Deed of Gift to settle his private matter is to ask his lawyer to write in on behalf of HIS OWN CAPACITY as one of the inheritors of LKY's estate to get the Deed from National Heritage Board. Having the right to the Deed doesn't mean that you can use the wrong channel or your official capacity as Prime Minister to get the Deed for your private use. Thus, it is very disappointing to note that Opposition MPs didn't make this point clearly in parliament in objection to his flimsy and unconvincing defence. In Hong Kong, there were cases of politicians or political appointees being charged and imprisoned for misusing information obtained in official capacity for private use. There is a clear cut line in maintaining good governance. Whether the Ministerial Committee is "secret" or not, or whether PM Lee recuse himself from this Ministerial Committee or not, does not clear the fact that such arrangement of having "direct subordinates" to meddle or investigate into the DIRECT Boss' matters is a total upheaval of hierarchical ethics! And obviously, it is a messy conflict of interests in itself! We only have superior conducting investigation into subordinates' matters but direct subordinates investing and meddle in superior's matters is really hardly heard of! This is also a clear breach of Separation of Powers! Besides the declared members of this Ministerial Committee are neither history experts nor heritage preservation experts! 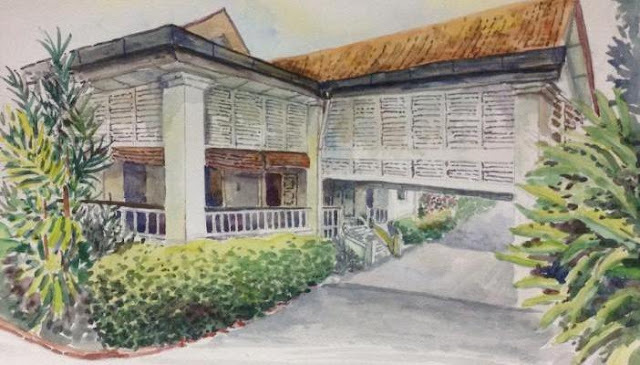 Thus on what basis or merits do they have to convene such a committee to determine the "options" for the Oxley house in terms of heritage preservation? LHY and LWL had accused the committee of focusing on the attacks on the legitimacy of LKY's Last Will instead of the Options. And unwittingly, PM Lee has put up the summary of his Statutory Declaration which confirms that his main submission to the Ministerial Committee is all about putting doubts on the validity of LKY's Last Will. How could anyone come to the conclusion that LHY and LWL have put up "baseless" allegation in this case? The proper place to question the validity of the Last Will is to challenge the probate of the Last Will in court. If PM Lee is reluctant to go to court for fear of tarnishing his father's good name, then why would he bring it up to his subordinates in this Ministerial Committee? The proper way of dealing with determining the OPTIONS is to call in REAL INDEPENDENT EXPERTS from the academic field to look into it instead of the ministers! Why isn't this so? Thus the pertinent question should be asked in parliament is that why isn't an independent penal of experts set up instead of the Ministerial Committee which is bound to breach basic hierarchical ethics tainted with conflict of interests? In Hong Kong, when they are looking into heritage preservation of any buildings or landmarks or sites, they will convene an independent penal filled with REAL experts in the respective fields, instead of Ministers. Just simple as that. This is the MOST Ridiculous part of the whole saga. The Prime Minister Office is neither the official owner of ANYTHING from the Estate of LKY although Lee Hsien Loong the son, is one of the inheritor. And Ho Ching, PM Lee's wife, has no official appointment in PMO but yet, she can be listed as the person for contact representing PMO to give away something that doesn't even belong to PMO! And our dear Prime Minister just brush it off by saying that they were just excited to find something of "historical significance" to give it to NHB for its exhibition, without prior informing his own siblings! How could this be a convincing explanation of such lack of clear differentiation between what is Official and Private? LHY and LWL had provided the clear documented evidence of such blatant misuse of official capacity in this case but yet, people are saying that they didn't provide "enough" evidence for this? In Singapore, even if the Prime Minister wanted to sue anybody for defamation or anything, he cannot use the letter head of the Prime Minister Officer (PMO) or his title as Prime Minister! This is a clear cut between Official business vs Private matters. Thus, apparently, the Prime Minster has totally ignored BASIC Official protocols and blurred the lines between his Official political appointment with his private matters! The PMO doesn't own any thing from the estate of LKY and it should not be used to process any things obtained from the LKY estate! In Hong Kong, Donald Tsang who was former Chief Executive and Finance minister of Hong Kong, was chided for using official letterhead of his office to write to government departments to request for information and help for his private matters. This is a big taboo in Hong Kong. Good Governance and Separation of Powers are inseparable. All civil servants are expected to have a clear concept of "Official Capacity" vs "Private Matters" and what will possibly constitute conflict of interests. More so for top civil servants as well as political appointees like Ministers and Prime Minister. On top of that, the only why to avoid conflict of interests is to maintain proper Separation of Powers. Conflict of Interest does not mean there must be real wrong doing of any sort but by virtue of POSSIBLE undue influence based on any close relationship of any kind, one must declare such potential conflicts. Beside the consideration of Conflict of Interest, the OVERALL system of Separation of Powers must be maintained. PM Lee clearly lacks the strong sense of "Separation of Powers" and most important of all, has blurred all lines between what is Official business vs Private matters. There is a CLEAR consistency demonstrated in all the issues brought up by PM Lee's siblings that suggests that PM Lee himself lacks clarity in differentiating what is "Official" vs "Private" matters. He is setting a terrible example for the whole civil service and I have serious doubt that with such aptitude and attitude, he couldn't possibly maintain Good Governance without any concept of Separation of Powers and avoidance of conflict of interests. If such things happen in Hong Kong, such evidence along with the self-admissions made by either the Ministers or the Chief Executive himself would be serious enough to trigger or warrant an immediate thorough investigation, either by an independent commission convened by the Legco or any appropriate authority, like ICAC. But just too bad, this is Singapore which doesn't follow such strict and stringent rules set upon the civil service as well as political appointees. For the Prime Minister to brush it aside by saying "no evidence" at all and to state that he himself will ask for investigation if there is evidence, is just totally unconvincing and ironically, lack of the very principle of Separation of Powers and avoidance of conflict of interests! It is not for him to decide whether there is enough evidence thrown against himself! It is should come under an independent panel to decide on that! Separation of Powers and avoidance of conflict of interests must not only be maintained but must also be SEEN to be maintained. There are laws and mechanisms available within the system to make things transparent and these should be strictly followed. Sad to say, the TOP boss, the Prime Minister himself, is now seen to breach every important part of this system. The Prime Minister doesn't deserve any "benefit of doubts" because it is totally unacceptable to let any DOUBT on his own conduct and management to exist and linger in the minds of Singaporeans. All doubts should be cleared and none should left lingering. Else I would regard that as a sign of unfit for the top public office. Thus, I maintain my call for Lee Hsien Loong to resign as Prime Minister for the sake of Singapore. Hahahahahaha, Goh Meng Seng please lah. As a veteran opposition politician in Singapore, you don't call for Lee Hsien Loong to resign as Prime Minister and expect him to resign. You lead a party to win the next election and in doing so, make Lee Hsien Loong lose his job as Prime Minister! Even if the cursed of the house had sobered up, the smell will lingered on. Part of their well-choreographed plan must place such an ill position on their lives now. Green man for both the rights of motorist and pedestrians at the same time is a recipe for disaster. Roads are already nerve-wrecking enough with drivers and pedestrians fuelled their anger in a tightly squashed nation. His ministers, his people and his top civil servants. Regretfully his 3 groups hate the guts of each other. Whose side will he take?